Batman: Arkham Knight is a 2015 action-adventure video game developed by Rocksteady Studios and published by Warner Bros. Interactive Entertainment for the PlayStation 4 and Xbox One video game consoles, and Microsoft Windows. 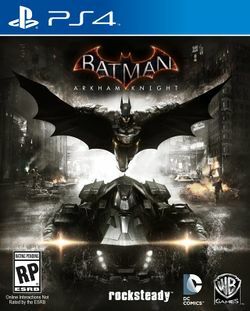 Based on the DC Comics superhero Batman, it is the successor to Warner Bros. Games Montréal's 2013 video game Batman: Arkham Origins, and the fourth main installment in the Batman: Arkham series. Arkham Knight was released worldwide on June 23, 2015. Written by Sefton Hill, Ian Ball and Martin Lancaster, Arkham Knight is based on the franchise's long-running comic book mythos. Set one year after the events of 2011's Batman: Arkham City, the game's main storyline follows Batman as he confronts Scarecrow, who has launched an attack on Gotham City, causing a city-wide evacuation. Aided by the mysterious Arkham Knight, Scarecrow unites Batman's greatest foes in a plot to finally destroy Batman. The game is presented from a third-person perspective, with a primary focus on Batman's combat and stealth abilities, detective skills, and gadgets that can be used in both combat and exploration. Arkham Knight also introduces the Batmobile as a playable vehicle, which can be used for transportation or combat. The game expands Batman's arsenal of gadgets and combat attacks and offers a more open world structure, allowing the player to complete side missions away from the primary storyline. The console versions of Arkham Knight received acclaim from reviewers, particularly for its narrative, visuals, gameplay, combat, and world designs, with most criticism given to the emphasis on the Batmobile. The Windows version, however, became the subject of intense criticism due to major performance issues, even on high-end graphics hardware, prompting Warner Bros. to temporarily withdraw that version of the game from sale. Rocksteady released additional content for the game, including story-driven missions, challenge maps for Batman and his allies, Batmobile racetracks, and skins for Batman, his allies, and the Batmobile. This page was last edited on 11 October 2016, at 22:51.